The second section of Joseph L. Graves’ The Emperor’s New Clothes continues his cavalcade of wrongness. 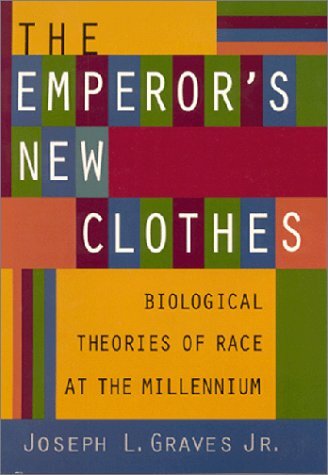 The second section of his book, â€œDarwin and the Survival of Scientific Racism,â€ begins on page 53 and continues until page 104. Firstly, and somewhat esoterically, Graves is stuck in the past with his description of group selection. On page 63, he writes that group selection â€œcould be favored only if the groups were composed of closely related individuals.â€ However, kin selection could both further or retard group selection (Wilson & Holldobler, 2005). Further, evolution of enthocentricism and xenophobia (forms of altruism towards in-group members and against out-group members) can be modeled through computers (Hammond & Axelrod, 2006). Ultimately, while the force of altruism can be measured and its significant debated (Kurzban & Houser, 2005), Graves’ claims about the role of pre-existing genetic similarity in group selection are questionable at best. Graves uses the terms â€œartificialâ€ and â€œnaturalâ€ in a strange manner. While discussing the well-known genetic factors that cause different breeds of dogs to exhibit different levels of intelligence, behavior, and socialiability, Graves writes â€œThe type of intense artificial selection used to differentiate traits in animal breeds is not seen in humans.â€ What is meant here. If you take â€œnaturalâ€ to mean that which happens in the absence of a central authority, then clearly dog breeds are the result of natural selection. Many wolves and early dogs experienced an ecosystem in which they found a niche with human society, and they evolved accordingly. But if you take â€œnaturalâ€ to mean man-made, his criticism still falls flat. To the extent that human survivability depended on interaction with others, natural selection on human was guided by â€œartificialâ€ human decisions. This can have positive or negative implication â€“ Ridley notes that the â€œevolutionary psychologist Sarah Hrdy has hypothesized that juvenile human beings are “designed” by their past to expect to be reared communally rather than in a nuclear familyâ€ (2003, 246) â€“ but what is known for sure is that the natural v. artificial distinction is meaningless. Graves’ discussion on the settlement of North America is similarly quixotic. He uses â€œarchaeological sites in New Mexico and South Americaâ€ (96), without citing references or sayingg which sates, to date American Indian residency in the western hemisphere to â€œabout thirty-five thousand years ago.â€ This is out of line with genetic tests, of about seventeen thousand years ago (Mulligan, Hunley, Cole, & Long, 2004; Zegura, Karafet, Zhivotovsky, & Hammer, 2004) â€“ roughly half of what Graves claims. Even trusting Graves’ claim about the lack of skin color gradation among American Indians, claiming that lack of change in one element implies that evolution cannot happen swiftly is ludicrous. Just recently we learn that lactose tolerance evolved among some Africans in historical times (â€œAfrican Adaptation…,â€ 2006). Further, it is possible that other, even more important, traits were under regional selection in South America. The extremely high penetration of a gene that causes ADD in South America as opposed to Asia (Ding, et al., 2002) is just one example of this. Ironically, Graves’ commits the genetic fallacy in his book. The genetic fallacy is of the form â€œa and b, b is bad, therefore a is bad.â€ It is a form of guilt-by-ideological-association whose most tiresome form is linking some activity to the Nazi government of Germany. Adolf Hitler famous was a tee-totaling vegetarian, and from that defensive drinkers and carnivores have categorized their enemies as fascists in disguise. Similarly, anti-abortion activists, anti-gun-control-activists, and anti-eugenics activists have attempted to tar an opposing ideas by claiming the Nazis held it. Indeed, this last example is exactly what Graves commits. â€œCertainly eugenics,â€ he writes,â€ has to take some of the responsibility for the Holocaustâ€ (100). Yet graves is not similarly accusatory toward progressive politics, which was in the eugenetical forefront (Pinker, 2002). The reason is obvious: that eugenics and progressive politics were associated in the past no more tars progressivism than that eugenics and Nazis were associated in the past no more tars eugenics. It this would like criticizing eugenics by linking it either to the Communist or RPR parties, as eugenics is common in both the People’s Republic of China (â€œEnter the Dragonâ€, 2003) and France (Leroi, 2006). Indeed, some American parents are active dysgenicists (Sanghavi, 2006). Would a rhetorical attack against federal policies mean anything in that debate?